Having recently sold its millionth smartwatch, original Kickstarter darling Pebble is doing all it can to battle off the Android Wear invasion and hopefully sway those on the fence about the Apple Watch. But, to take pride of place on our wrists it needs to impress in the app department. Now, we're not talking about games or overly intricate apps here, the Pebble only has a small monochromatic display, what we want is useful tools and add-ons that extend app functionality from our phones. Whether it's tracking our steps and ditching the fitness band or changing tracks in Spotify, all these apps do just that, and they have become part of our daily routine. Our wrists simply aren't big enough for both a smartwatch and a fitness band, but thanks to Misfit's Pebble App we no-longer have to decide whether it's our steps or the time that we track. Due to the built-in sensors on the watch and phone, the accuracy here is pretty impressive – definitely on-par with Misfit's dedicated Shine wearable – and there's sleep tracking too, so you can keep an eye on your slumber. You can scroll through your stats for the week, or beam the data back to the app for more in-depth perusal. It currently only supports iOS, but we're told Android compatibility is on the horizon. One of the major annoyances we have with the current Pebble hardware is that it can only store eight apps at once, leaving us with the unenviable task of choosing which one to delete when we download something new. Cards for Pebble is worth it, then, because it bundles in several different functions. Alongside an information-laden watch face, you can use it to view your synced calendars, check on the weather and even delve into the latest stock prices. We especially like the travel time updates, which gives you an overview of how long it'll take you to get to your next appointment. Navigating around busy streets with just a tiny monochromatic display for support when our 5-inch smartphone is sitting in our pocket may seem like a borderline stupid idea on the face of it, but there's something about Pebble Nav that sees us constantly fire it up. It only shows your next action, turn left in 30-yards for example, so the screen isn't bogged down with information and the maps have all been specially built for the black and white display. You don't even need to keep an eye on the watch, as it'll buzz your wrist just before you need to turn - handy. It's especially useful when you're on a bike. Just strap your Pebble to the handlebars and it'll make sure you're on the right route. If you've been dreaming about paying for your dinner just by having the waiter scan your watch for as long as we have, you'll need to download PayPal's new app. Striking a blow at the Apple Watch and Apple Pay, before they've even launched, the Pebble and PayPal combo doesn't even need a smartphone connection, as it dives directly into your account. Anywhere you can pay with PayPal – GBK or Pizza Express for example both accept it – you can use this app. It generates a QR code which, when scanned, deducts the money from your PayPal account. The app will also search for local spots where this payment method is accepted. 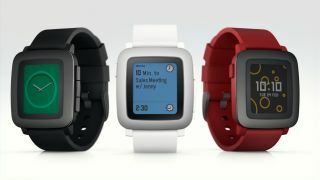 We've been disappointed with the way the Pebble handles music track switching. Basically, you can only set one app that the watch will recognise, so if you use a combination of Spotify and PocketCasts you need to manually change it in the settings app before you can use the remote function. But fear not, forMusic Boss corrects this, automatically switching to the app it can see you're using. You have a full set of media controls, the ability to rate songs on the go, if that's your bag, and it works great as a Chromecast remote, too.